BURBANK, CA (June 10, 2014) – The exhilarating and terrifying journey of the Winchester brothers continues as Warner Bros. Home Entertainment Group delivers the ninth season of Supernatural on Blu-ray™ and DVD on September 9, 2014. Supernatural: The Complete Ninth Season contains all 23 gripping episodes from Season Nine and is packed with over four hours of bonus content – including featurettes, commentaries, a Comic-Con panel, deleted scenes, and a gag reel. Fans that purchase the Blu-ray™ will also have access to a Digital HD copy of all 23 episodes. 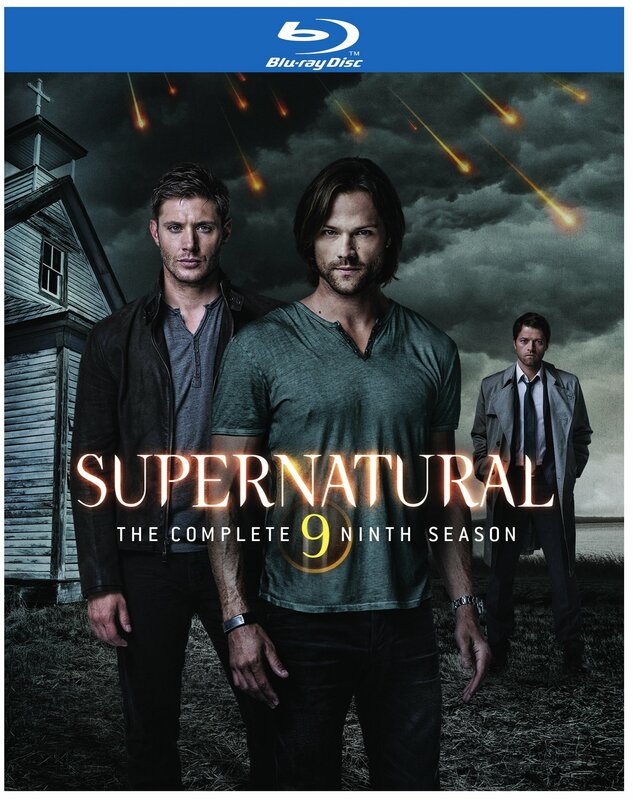 Supernatural: The Complete Ninth Season is priced at $59.98 SRP on DVD and $69.97 SRP on Blu-ray™. How do you deal with a fallout of heavenly proportions? With the angelic Host’s descent to Earth, Sam and Dean are now facing a world inhabited by thousands of powerful beings, who soon form their own chaotic agendas. Before tackling the threat of the “loose nukes” roaming the globe, however, the Winchesters engage in their most personal conflict yet. Meanwhile, Castiel finds he’s more vulnerable – and yet capable of more humanity – than ever. As the threat escalates, a way must be found to reopen the gates of Heaven and head off a demon insurrection in Hell. The whole time, darkness leaves its mark on Dean, but has he finally crossed the line to protect his family? The excitement of this 23-episode ninth season is positively epic. Airing Tuesdays at (9/8c) on The CW, Supernatural stars Jared Padalecki (Friday the 13th, Gilmore Girls) and Jensen Ackles (Smallville, My Bloody Valentine) as Sam and Dean Winchester, in addition to Misha Collins (24, Girl Interrupted) as Castiel. Created by Eric Kripke (Revolution), the ninth season of the hit series was executive produced by Robert Singer (Lois & Clark: The New Adventures of Superman), Jeremy Carver (Being Human), Phil Sgriccia (Smallville), McG (Terminator Salvation) and Adam Glass (Cold Case). Supernatural returns for its tenth season this fall. With Blu-ray’s unsurpassed picture and sound, Supernatural: The Complete Ninth Season will be released in 1080p Full HD Video with DTS-HD Master Audio for English 5.1. The Men of Letters Interactive Set Experience – Interactive menu allows the viewer access to numerous featurettes hidden in the various rooms of the Men of Letters set. o Men of Letters: The Winchester Legacy – This documentary featurette will explore the rich mythology of the Men of Letters – from its roots with the Winchester family to the hidden compound that was passed down to Sam and Dean by their grandfather. o Designing the Men of Letters Bunker – From concept to completion, Production Designer Jerry Wanek will guide us through the creation of Supernatural’s largest set. o Supernatural – Bound by Blood: Decisions and Consequences – The documentary featurette explores the ninth season’s theme of consequences for Sam and Dean. o Crow’s Nest Tour- Production Designer Jerry Wanek takes the viewer on a set tour of the Crow’s Nest. o Library Tour – Production Designer Jerry Wanek takes the viewer on a set tour of the Library. o Lab – Production Designer Jerry Wanek takes the viewer on a set tour of the Laboratory. o Galley – Production Designer Jerry Wanek takes the viewer on a set tour of the Kitchen. o Dorms – Production Designer Jerry Wanek takes the viewer on a set tour of the Dormitories. o Room 7B – Production Designer Jerry Wanek takes the viewer on a set tour of the Dungeon. 2013 Comic-Con Panel – Cast and Producers discuss the upcoming storylines of Season 9.
o Audio Commentary – “Mother’s Little Helper” – Writer/EP Adam Glass and Director/actor Misha Collins provide commentary on his directorial debut. Behind the Scenes of Supernatural: A Fan’s Perspective – Mockumentary hosted by Misha Collins going behind the scenes on the set of Supernatural. Running Time: Feature: Approx 1012 min /Enhanced Content: Approx 261 min. Warner Bros. Home Entertainment Group brings together Warner Bros. Entertainment’s home video, digital distribution, interactive entertainment/videogames, direct-to-DVD production, technical operations and anti-piracy businesses in order to maximize current and next-generation distribution scenarios. WBHEG is responsible for the global distribution of content through DVD, electronic sell-through and VOD, and delivery of theatrical content to wireless and online channels, and is also a significant worldwide publisher for both internal and third party videogame titles. Posted in News, Press Releases, Warner Bros.Tagged Supernatural, Supernatural: The Complete Ninth Season, Warner Bros.